In the following, we illustrate the current large-scale pattern of CO2 sources and sinks and its variability, using results from a recent inversion study (Rödenbeck et al. 2003). In this study, special care was taken to address several of the shortcomings of previous studies. The atmospheric transport is based on the time-varying meteorology from the National Centers for Environment Prediction (NCEP) analyses over the past 20 years. This approach allows exact time synchronization between model simulation and observations by sampling of the model at the same time and location as the observations. Atmospheric stations were selected for long-term continuous homogeneity of the records in order to eliminate spurious changes induced by data gaps. Because the density of observing stations has increased significantly over the past 20 years, four main inversions were run with different numbers of stations and correspondingly different inversion periods. Comparisons between these inversions over the overlapping time intervals permit an assessment of the robustness of large-scale source features with respect to the density of observation stations. The inversion used the high-resolution approach of Kaminski et al. (1999) by determining monthly sources on a global grid of approximately 8° latitude by 10° longitude, while the atmospheric transport is simulated using the TM3 transport model (Heimann and Körner 2003) with a resolution of approximately 4° latitude by 5° longitude and 19 layers in the vertical dimension. Over the oceans, the prior information on the sources was specified from the large-scale patterns of the air-sea fluxes inferred from oceanic data by Gloor et al. (2003), modified regionally by the observed seasonal pattern (Takahashi et al. 2002). Over land the a priori source pattern was specified from the mean seasonal cycle of net CO2 fluxes as simulated by the Lund-Potsdam-Jena (LPJ) terrestrial biosphere model (Sitch et al. 2000). In addition, the fossil-fuel emission distribution was specified from the EDGAR database (Olivier and Berdowski 2001). The atmospheric observations were obtained exclusively from the U.S. National Oceanographic and Atmospheric Administration-Climate Monitoring and Diagnostics Laboratory network (Conway and Tans 1999) to eliminate possible biases caused by unknown calibration offsets between networks. Colorplate 8 displays the net surface-air flux averaged over July 1995—June 2000, inferred from an inversion with 35 stations (shown as black triangles). Shown is the total surface-atmosphere CO2 flux including land, ocean, and fossil-fuel emissions (a) and the ocean and terrestrial fluxes only (b). Clearly, the total surface-atmosphere flux is dominated by the pattern of fossil-fuel emissions from the three major emission regions in the Northern Hemisphere: eastern North America, Europe, and eastern Asia. The mean pattern of the natural sources shows the expected CO2 outgassing in the equatorial oceans, especially in the Pacific, the uptake in the North Atlantic Ocean, and a weak source in and around the Antarctic. In the tropics the terrestrial carbon balance exhibits sinks in the central tropical regions in Amazonia, Africa, and Indonesia. The northern extra-tropics are dominated by a conspicuous source region in Eastern Europe and moderate sinks elsewhere. This pattern reflects the average over five years and may not be entirely representative of the longer-term source-sink distribution. In particular, the source in Eastern Europe may be a transient phenomenon. It is primarily generated by the stations in Hungary and at the Black Sea coast. It may, however, also reflect biases in the model transport or too-small industrial emissions estimates specified for this area. The inferred patterns near industrial areas may also be biased by neglecting the influence of carbon monoxide from fossil-fuel burning, which may be more significant on regional than on global scales (Enting and Mansbridge 1991). Interestingly, the European source pattern also appears in regional inversions for Europe based on the much denser regional observation network of the AEROCARB project (Rivier et al. 2003). error reduction = (posterior error - prior error)/(posterior error) and is expressed in percentage (Kaminski et al. 1999). The map in Colorplate 8c demonstrates the sobering fact that the employed network of stations reduces the error over most regions of the globe by only a modest amount. Only in the regions of the footprint of the monitoring stations does the error reduction reach values above 30 percent. Even though the posterior errors are partly correlated the error reduction increases when integrating over larger areas (Rödenbeck et al. 2003). Nevertheless, the small error reduction achievable with the present in situ observation network clearly demonstrates the need to enhance the measurements in undersampled areas and to develop methods to measure the CO2 concentration from space (Houweling et al. 2003). As already noted in the inversion study by Bousquet et al. (2000), the longer-term time-averaged source-sink patterns are less robustly determined than the temporal variability. The temporal pattern of the non-fossil-fuel sources and sinks averaged over five continental areas and three oceanic latitude bands is given in Figure 8.3. The different line styles indicate different inversion setups, with the shorter records including a larger number of atmospheric stations. The gray shading indicates time intervals of high values of the Multivariate El Niño Southern Oscillation Index (MEI) (Wolter and Timlin 1993). The prior fluxes included in these inversions do not contain any time dependence except the climatological seasonal cycle. Hence, the temporal trends resulting from the inversion are induced entirely by the temporal variability in the atmospheric concentration records. The variability of the terrestrial fluxes is clearly dominated by the fluxes from South America, which also show the strongest correlation with the ENSO climate fluctuation. The oceanic fluxes in the equatorial region, dominated by the Pacific Ocean, exhibit the expected reduced outgassing during warm El Niño periods. The great challenge is relating top-down estimates to processes at the surface. On the one hand, this correlation would provide confidence in the inversion results, and on the other hand, it would potentially help to quantify individual source flux mechanisms. Such analyses, however, have not yet been performed in a comprehensive way. One approach is based on trying to identify surface variables that potentially drive carbon fluxes. Examples include features that can be seen with remote sensing, such as vegetation indexes, fire counts, or climate variables. As an example, we show in Figure 8.4 time series of the monthly anomalous net non-fossil-fuel CO2 flux for two regions, as inferred from the atmospheric inversion described above (solid line), and compare it with fire counts detected from space, aggregated over the same spatial region (dashed line, arbitrary scale). The degree of correspondence between the time series indicates that fire is closely linked to anomalous CO2 fluxes from the terrestrial biosphere. Because this is not a quantitative comparison, the correspondence may mean that similar driving conditions exist for enhanced CO2 fluxes and for fires. Alternatively, the flux anomaly may be caused by the fires themselves, as inferred from other studies (Langenfelds et al. 2002). Indeed a preliminary comparison with modeled carbon emissions from fire (van der Verf et al. 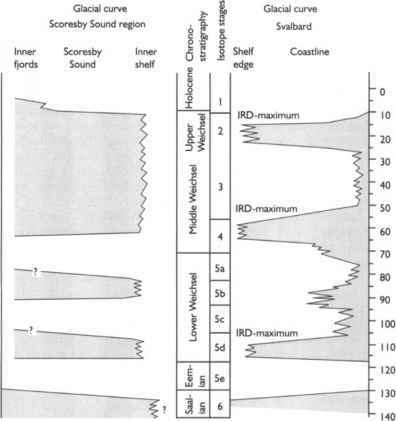 2003) shows that these may account for up to 50 percent of the anomalies inferred by the inversion (Rödenbeck et al. 2003). Regional comparisons of top-down fluxes with bottom-up model simulation results have shown encouraging results in particular areas (Bousquet et al. 2000; Janssens et al.